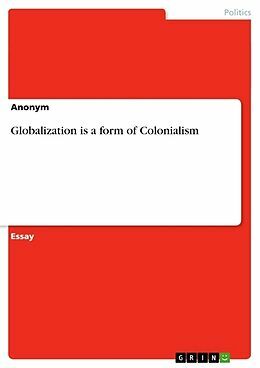 Essay from the year 2011 in the subject Politics - International Politics - Topic: Globalization, Political Economics, grade: 1,3, , language: English, abstract: This paper analyzes the historical phenomenon of colonialism and globalization and the similarities in their ideologies. In addition, using examples of nations and multinational corporations, this paper tries to find economic and social connections between colonialism and globalization in the behavior of suppressor and oppressor. Furthermore, the term neo-colonialism is going to be researched and some recent examples of expansion and discrimination in different countries are shown.